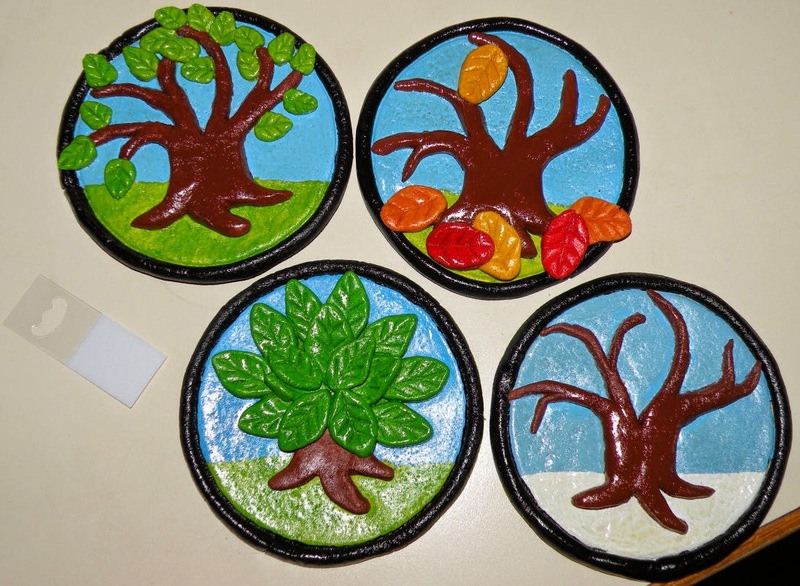 I have finally finished the tree plaques I've been working on (see here and here)! Now that they're finished, I'll be packing them away until Christmas as part of the Handmade Holiday Crusade 2010. I'll be giving them to my mom and I expect she'll hang them in her kitchen. I don't know if she'll hang just one and change it out season by season, but I imagine she'll hang all four at once so she won't have to remember to change them. I bought these self-adhesive saw-tooth plastic hangers to stick on the back (you can sort of see one there in the picture). I just hope the adhesive is strong enough. They've been sealed with glossy polyurethane spray. Hubby would have liked them to be sprayed with matte finish, but I preferred the polyurethane to acrylic spray, and gloss was my only option.